I mean I was there, obviously, talking her through it, but from start to finish, my kid's hands were the only ones to touch this entire batch of cold-process soap. Imagine. 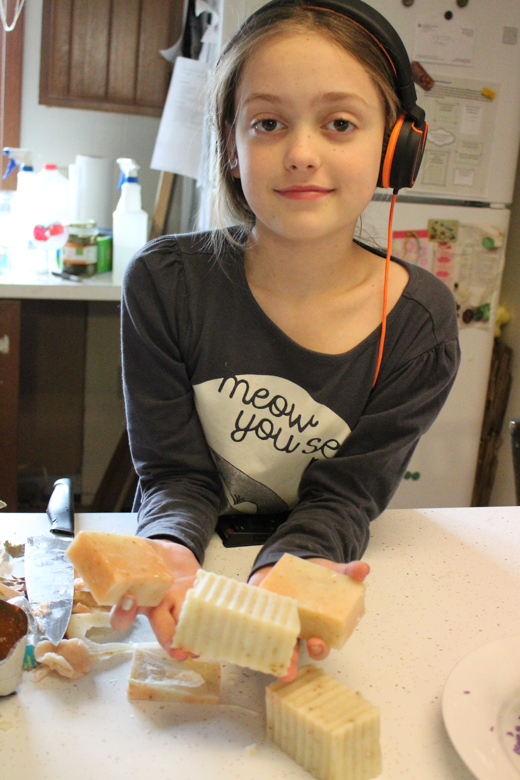 Eleven years old, and she can already make her own soap from scratch! Can you think of a more authentic homeschool credential? 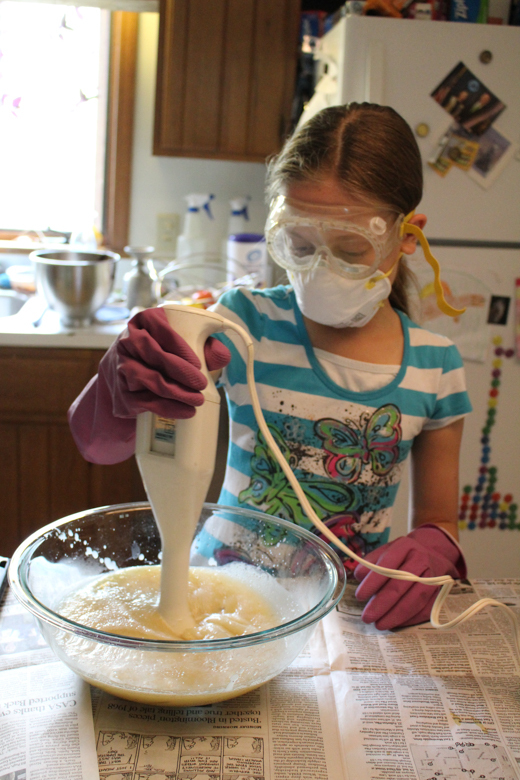 To be fair, there was an actual academic reason to set the child up to make cold-process soap. Syd and I are studying the history of fashion together this year, and it's mentioned (although I'd loooove to see the primary source...) in our textbook that the Celts introduced the Romans in Britain to both soap and pants. 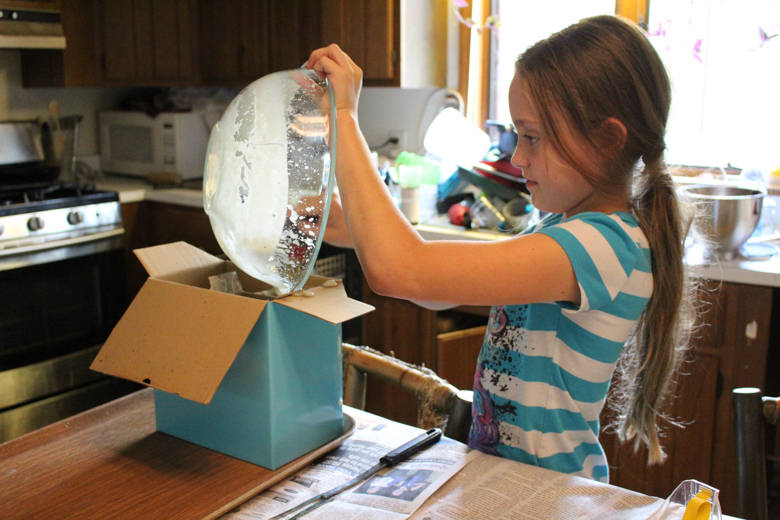 I'll be teaching Syd how to sew leggings after Christmas, but way back in September I taught her how to make soap. It's what a good little Celt knows how to do, you see. We used an easy beginner's recipe, mostly coconut oil and olive oil in simple ratios, something that you'd have to work hard at to screw up. 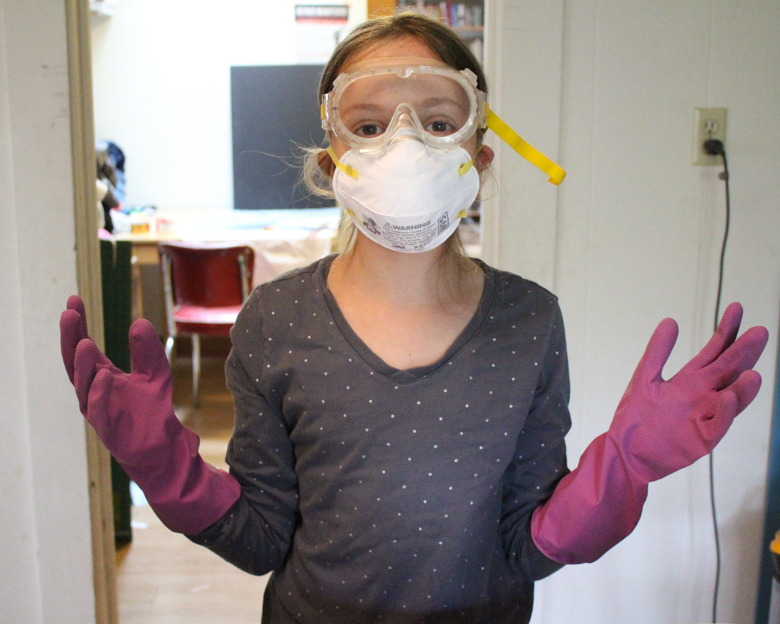 But when you're ready to get the lye out, on go the goggles, the breathing mask, AND the rubber gloves! Her gloves went almost up to her elbows, so when she got overheated in our early-autumn kitchen and wanted to change, I let her. Probably a mistake, but she didn't receive any chemical burns, so there you go. 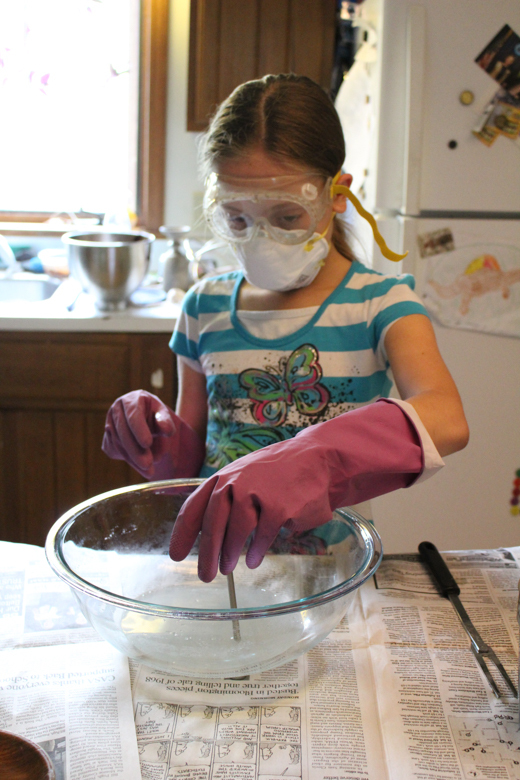 I wish I could find kid-sized lab coats for a reasonable price somewhere! --then took its temperature. It is hot, because yay for exothermic reactions! I didn't photograph the oils for some reason, but imagine them warming on the stovetop, and Syd moving from checking the temperature of the lye water to checking the temperature of the oils, waiting for them to approximately match. --and cut them to size! That wavy knife makes everything cuter! The soap should cure for a few more weeks after it's cut, and even then, the longer it cures, the harder and longer-lasting it will be. That latter tute actually reminds me that we haven't made homemade laundry soap since moving into our new house! As you can tell in that post, my process was quite organized, and without that same scaffold in the new house to remind me, it just slipped my mind. 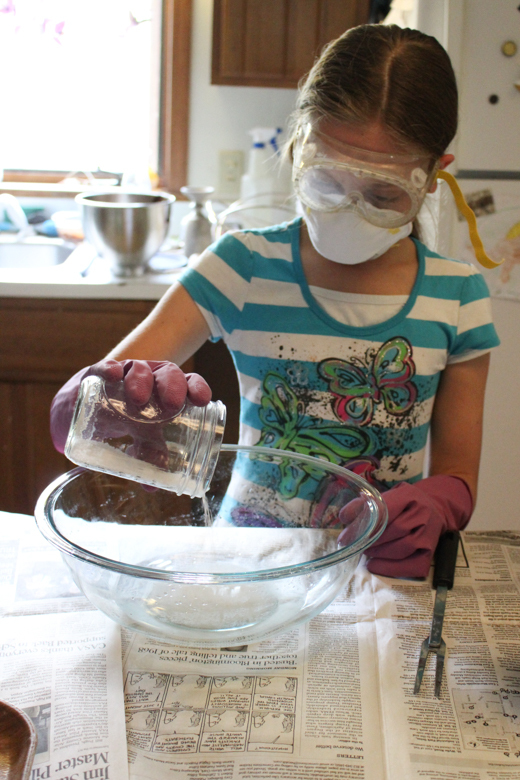 Mental note to make time this winter break to make laundry soap! Celtic knot templates. These could be coloring pages, but you could also use them as templates for shrinky dinks or clay. BBC Celts. The BBC Schools website is great for any topic that affects Great Britain. They have plenty of information about the Celts, as well as several hands-on activities for enrichment. 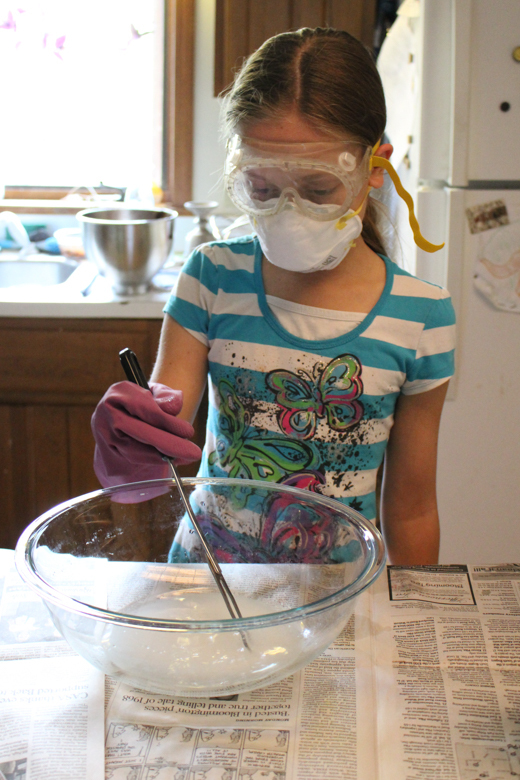 And, of course, if you're making soap with kids, you'll surely want some more interesting soapmaking resources! Explode Ivory soap. 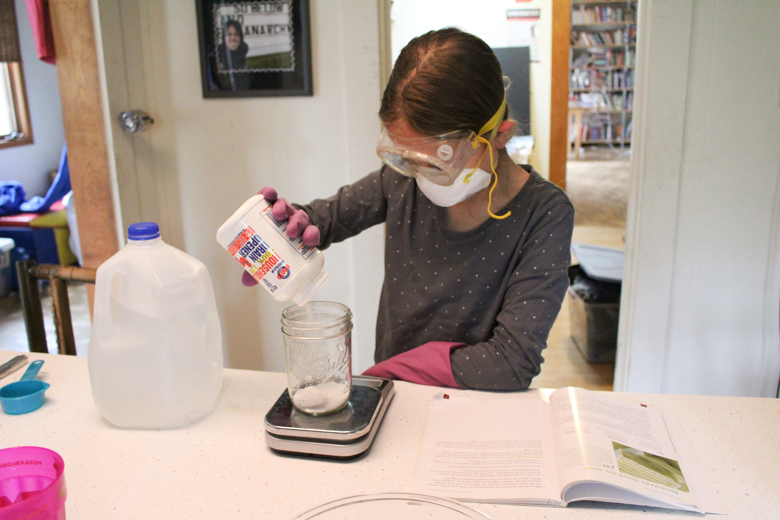 This is a fun rainy day activity, and perhaps an interesting tie-in to a consumer science study. Felted wool soap. 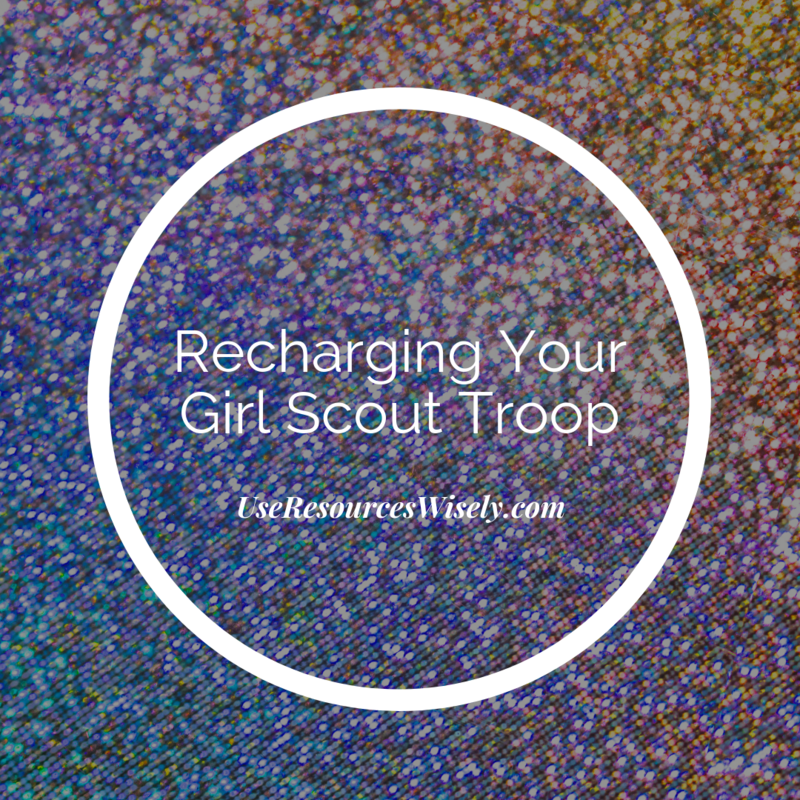 The kids and I have felted wool around rocks and wooden Easter eggs before, so I know that it's a great kid-friendly activity! Paint with bubbles. 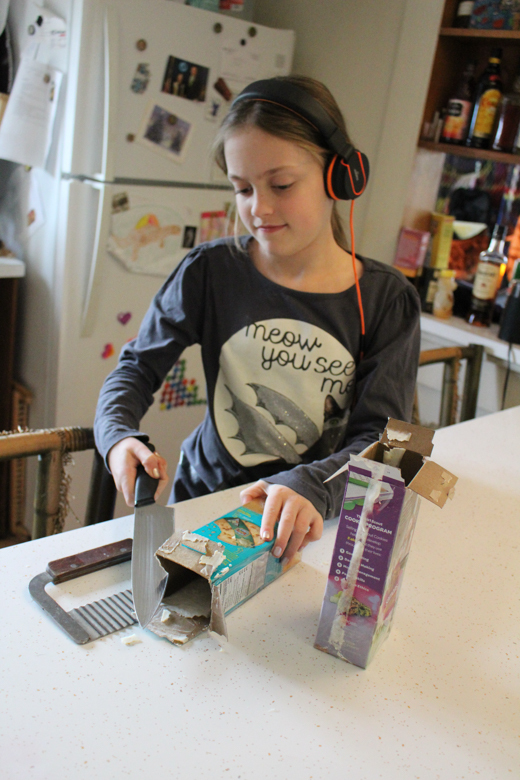 This is a way to get younger kids involved, but even my 11- and 13-year-old still love sensory activities like these. 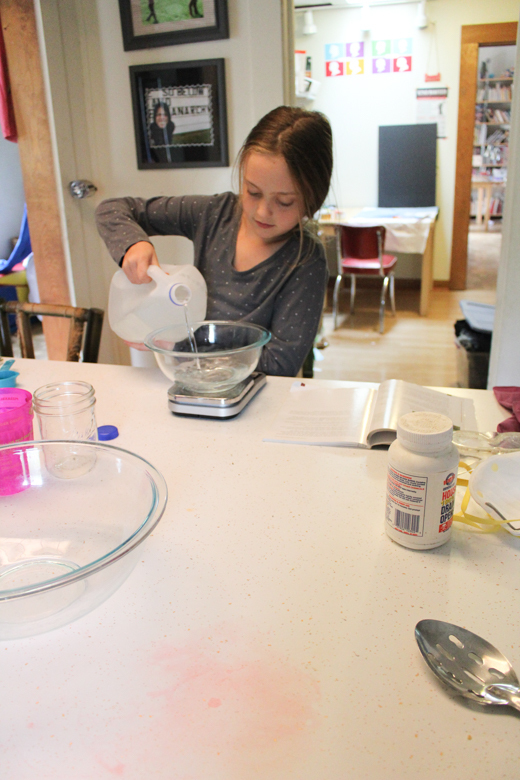 Here are the books that Syd and I explored as part of our soapmaking study. Some are more on my level and some more on hers, and I have some bookmarked recipes still to try out in several of these! Homestead Blessings. This DVD is kind of amateurish and they don't use safety equipment (gasp! 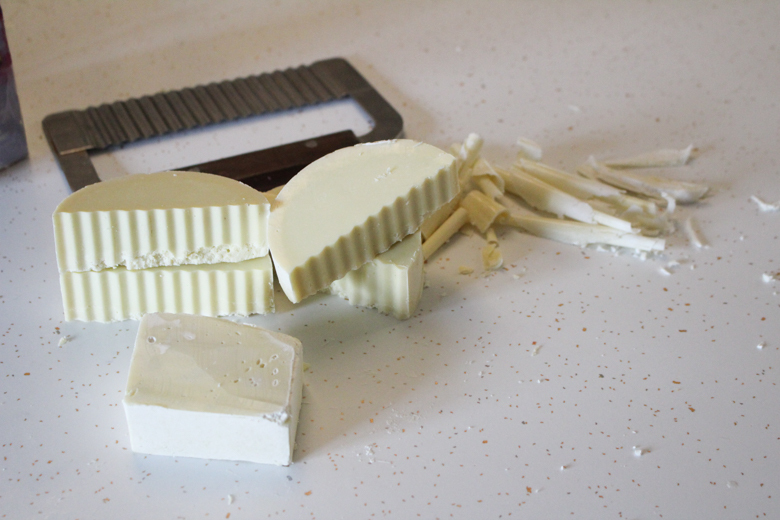 ), but it's still helpful to see the process of soapmaking from start to finish. Just wear goggles, though. 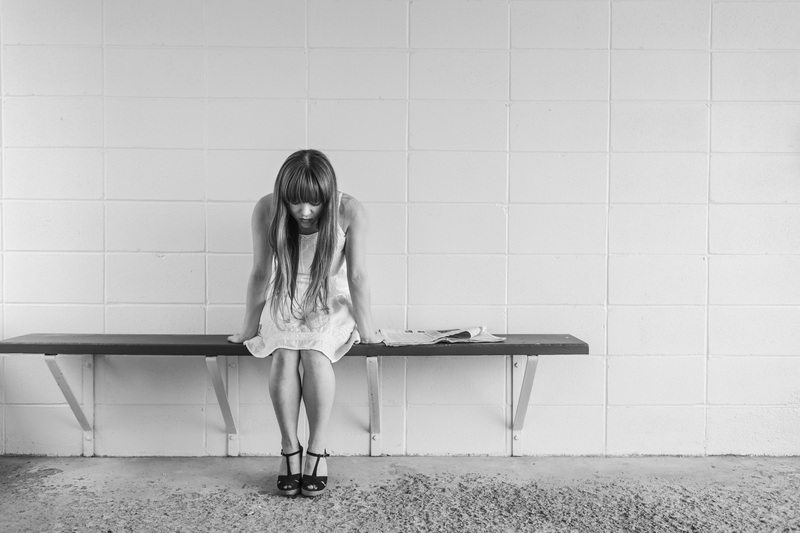 Dirt: The Filthy Reality of Everyday Life. I like to learn more about whatever the kids are studying, so this history of our conception of "dirt" in our cultures was super interesting. The Natural Soap Chef. Here's one of the books that Syd looked through to find the recipe that she wanted to use. 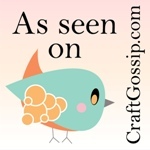 I still have a couple of recipes bookmarked in here! Handmade Soap Book. Here's another good one fore recipes. You Wouldn't Want to Live Without Soap! The kids both love this series, and I'm often surprised about how frequently they have a title suited to something that we're studying.